In West Maui’s historic Lahaina Town, on the makai (ocean) side of Lahaina’s world famous Front Street, Lahaina’s Beachside Cottage is nestled amongst surf shops and beachfront residences. Enjoy the luxury of full-sized kitchen appliances, white-washed window treatments, tropical hawaiiana-style furnishings including traditional Hawaiian quilts on the beds; and a clean, spacious living area opening up to a flat grassy backyard, planted with aloe, palms and ti leaf and a BBQ grille. Gentle strains of bird song, children laughing and Tongan choir music drift lazily through the sunshine dappled backyard. Check our great location on Google Map. Greet the morning with gorgeous mountain views from the front stoop: the West Maui Mountains are often ornamented with low puffy clouds, rainbows and distant waterfalls. While not ocean view, the Lahaina Beachside Cottage has direct beach access to Kamehameha Iki beach, historically chosen by Hawaiian Royalty as their private retreat. A cultural renaissance is taking place here with preservation of an ancient heiau, plans to restore the Moku'ula island and pond, and the re-introduction of ancient sailing canoes. Once a year, in May, this beach park is host to the International Festival of Canoes. Today, this special stretch of white sand is popular with surf schools for its easy, beginners and intermediate break (Breakwall). A protective reef creates shallow, calm waters also ideal for learning to snorkel or floating lazily on a rubber raft in the sunshine. Kamehameha Iki is a unique, powerful and breathtaking spot for watching the sunset. From here you can see three other islands: Kaho’olawe, Lana’i and Moloka’i. Next door is the historic Church of the Holy Innocents, across the street are tennis and basketball courts, the public pool is 1 ½ blocks away and nearby is the headquarters for Maui Nei walking tours and the Shops at 505. The shops are home to Whalers General Store for simple groceries, Gabby’s pizzeria with pool tables, Bamboo’s sushi and sports bar, salon and spa services, local art galleries, gift shops, fine beachfront dining at Pacifico’s and hula dinner shows—and this is all just a block away! Two minutes north in the opposite direction on Front Street is the Lahaina Visitors Center in the old courthouse, the Wharf Cinema Center, the harbor and a plethora of more coffee shops, restaurants and fun shopping. From Lahaina Beachside Cottage it’s only fifteen minutes North to the resort and hotel mecca of Ka’anapali Beach, and thirty minutes to Kapalua Bay. We are 45 minutes from the main airport in Kahului (OGG), and 20 minutes from the inter-island airport in Kahana. Public transportation is inexpensive, usually a $1. But there is plenty to see & do right in Lahaina. 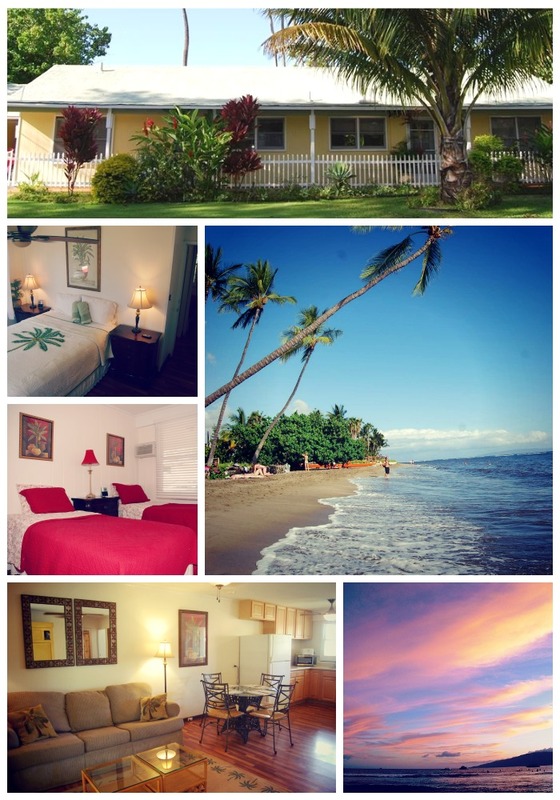 Pleasant and light, the Lahaina Beachside Cottage is part of a cottage-style duplex with a private kitchen, living area, two bedrooms (one queen and two twin beds) and one bath, making this an ideal vacation home for a family or group of friends. With the use of a queen sleeper sofa, Lahaina Beachside Cottage can comfortably sleep up to 6 guests. Translated “Lahaina” means merciless sun. We are located in the best sunny weather location on the West Side. As you drive farther north there are more frequent rain showers and gusty winds. Lahaina averages 75 degrees Fahrenheit, warmer in the summer and cooler in the winter. For current weather reports check Wunderground. The best part about visiting Lahaina is the easy access to all types of activities. Snorkeling, scuba diving, surfing, surf lessons, hiking, bike rentals, art galleries, historic tours and sites, shopping, luaus, dinner shows, cocktail cruises and more! Seasonally offered is whale watching or parasailing. Our concierge and activities booking service, Best Hawaii Activities, can assist you in scheduling a fun-filled vacation.